If you’re new to Squarespace and you’re trying to navigate the new platform, understanding the terms and language used can be massively helpful. 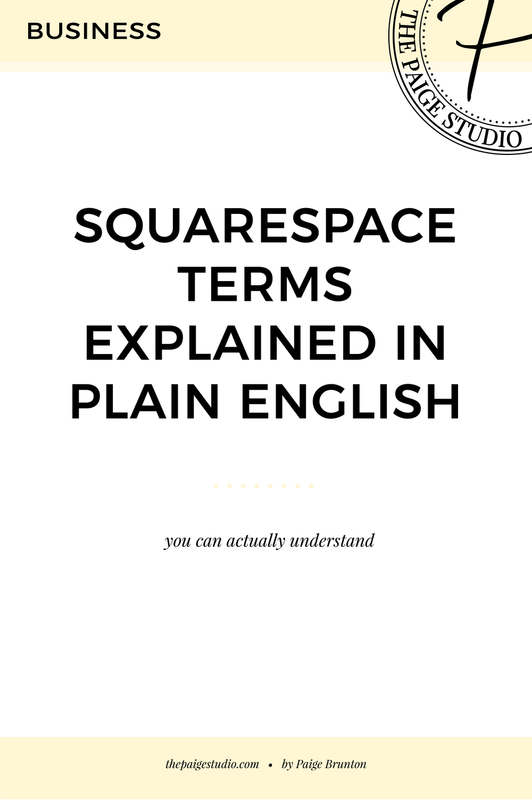 So for all of your new Squarespace users, here’s a list of common Squarespace terms, explained in plain english that you can actually understand. If you’re really new to the whole site building thing, I’d definitely also suggest reading general website building terms in plain English you can actually understand which takes you through some website definitions that are still important, and used in both Squarespace and other platforms too. Template: Every Squarespace site starts with a template. It’s the ‘structure’ of your website. If you’re familiar with WordPress, a Squarespace template is the equivalent to a WordPress theme. They’re basically the same thing, just with a different name. Template Family: Templates in Squarespace are grouped into families (aweee)! A template family has all of the exact same features and style editor options. Some template families have more features and style editor options than others. Every template in a template family can do the same thing, they’re just styled differently on the Squarespace templates page to show you the many design options you have within that template family, and to make it quicker to get started, by choosing a template that already has the general layout and look you like. Fun fact: If you take any template in a template family, you can achieve the exact same end result as another template in the same family as they have the same functionality. Style Editor: The Style Editor controls all of the ‘styles’ or design bits on your site. The style editor lets you change font styles, sizes, spacing, colors of buttons, newsletter blocks, navigation items, checkout items, social media icons, search bar, etc. Blocks: Squarespace websites are made up by blocks that are dragged and dropped onto the content area of a page. Each block has a different function, and many of their names are pretty self-explanatory such as a ‘text block,’ ‘spacer block’ ‘line block’ ‘image block’ ‘gallery block,’ etc. I’ll skip over the super obvious blocks, but will get into some lesser-understood ones in this post. Gallery pages: A gallery page is a page of your site where you may display images. Each template has a very interesting and different way of displaying images in a gallery page. Some templates have multiple options for the layout and look of your Gallery page. Editing which of the gallery page options you want to test out can be done in the Style Editor. Product pages: A page where you can display all of your e-commerce product items. You can also display products on non-product pages using summary blocks. Summary block: A summary block pulls a defined set of content you specify. Summary blocks many be placed anywhere on the content area of a page, so they’re useful if you want to give a little teaser of a larger amount of content somewhere else. Summary blocks can pull content from an event page, blog, e-commerce store, or gallery. Event page: An event page is a place where you can add new events to a calendar. Cover page: Think of a cover page as a landing or coming soon page, as this is what cover pages are most often used for. A cover page is a simile, non-scrolling page that holds a very small amount of content and maybe has a Call To Action on it. Folder: You know how some websites have drop down menus from their main navigation? This is achieved with a folder. You can take a folder, place it in your navigation and then drop other pages inside the folder. The pages inside the folder will then become the navigation drop down items. Index page: An index page allows you to make those trendy long, scrolling pages where you have multiple sections, each with different background colors and and design styles for each section. You can also incorporate a gallery page into a linger scrolling page with an index page. Head this was for a beginner’s guide to using index pages here. Blog page: A blog page is where you can write a blog. Blog pages can also come in handy if you need to make a directory of some sort on your site. Category: A category is another way to define a blog post by a specific topic. Generally you use less categories than tags. Head this was for a complete guide to using tags and categories here. Banner images: You know when you go to a site and there’s a large image covering the whole screen, possibly with some text, button or subscribe button on top? That’s a banner image. A banner image is a photo that fills the page from left to right. Slideshow banner image: A banner image which has buttons to the left and right to slide forward and backwards to the next images in the slideshow. Parallax: Parallax scrolling is a newer design trend where it looks as if the page is ‘melting’ into itself. This happens by the background of a section moving at a different speed than the content that’s placed on top. Pre-footer: A footer is the bottom bit of your site that’s o never page. A pre-footer is basically a second footer than comes above the actual footer. Burger navigation: This is another newer design trend, where the navigation of a site is opened by clicking on a ‘burger’ icon. The icon looks like three horizontal lines stacked on on top of the other (kind like a bun, patty and bun). Project pages: Project pages are a new type of page in Squarespace that is basically a more complex gallery page. In a project page you can use both text and images and the content appears to slide in from the bottom as you scroll down the page. Author profiles: Author profiles are a little section that’s added to the bottom of blog posts which generally has the authors photo and a bio. Infinite scroll: Like on Pinterest, Facebook and Instagram, the page just keeps on scrolling and scrolling for infinity … and beyond! There you have it! You know all the important Squarespace terms now, so it’s time to get to building your website!